The area burnt in the ongoing bush fire in the Nelson-Tasman region, largely around Pigeon Valley near Wakefield, can easily be seen in satellite imagery collected in recent days. 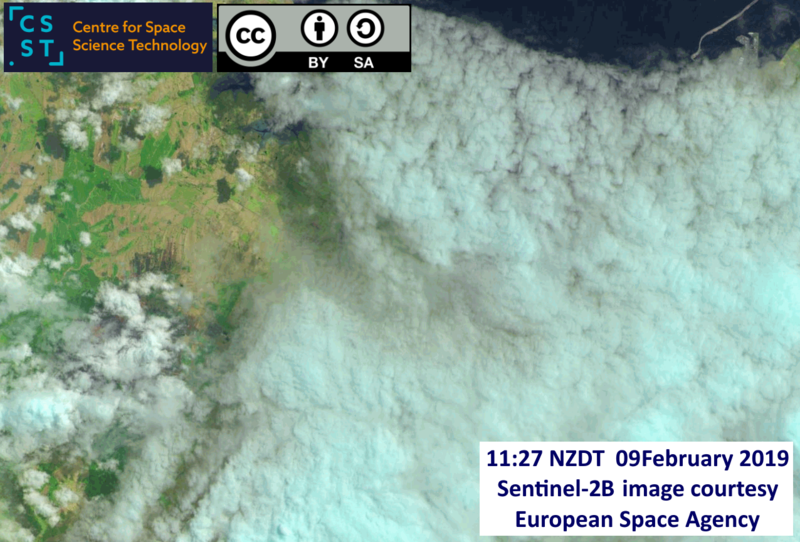 Earth observation satellites frequently cross New Zealand and, clouds allowing, collect imagery of the land and sea below. In later posts I will discuss such data collection in more detail, but the specific intent of this post is to make easily available some imagery showing the area burnt in the ongoing Nelson-Tasman bush fire. There are many potential free sources of satellite imagery, though of course one needs to know where to access the data, and how to process the images in order to get your desired results. I have been doing such things for some years, and so am well-practised, but downloading and massaging the imagery so as to be able to present the pictures below has taken me about six hours (on a Saturday afternoon!). That is: anyone could do it, but it’s not simply a matter of click-click. The European Space Agency, funded in this case by the European Union, operates a constellation of satellites called Sentinel, with the Sentinel-2A and -2B pair delivering imagery with ground-sampling distance (i.e. pixel size) ten metres in the visible part of the spectrum. 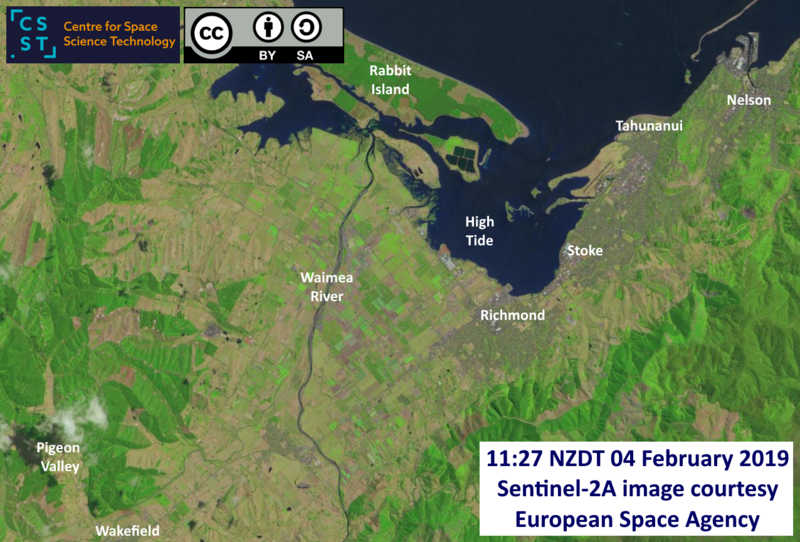 Through the efforts of the Centre for Space Science Technology New Zealand recently became a partner in the overall Sentinel effort, this being termed the Copernicus Programme. In all 13 different spectral bands have images collected, those at the longer wavelength of the near- and shortwave-infra-red having larger pixels, out to 60 metres. These two satellites share the same orbit – altitude 786 km, polar orbits tilted at 98 degrees to the equator, this keeping them in the same plane such that in essence the Earth rotates beneath them – but they are spaced by half an orbit so that they can collect imagery of different areas on each pass. They persistently cross regions below at about 10:30 a.m. local solar time. Being pushed for time I downloaded only standard red-green-blue (RGB) colour mix images with 20 metre pixels, rather than the huge files associated with the complete set of 13 bands at full spatial resolution. Having perused the images I selected those which were reasonably clear of clouds across the region in question (i.e. south-west of Nelson and near the Waimea River). The two best/clearest recent images were from January 15 and February 4. I then clipped the georeferenced images in terms of latitude and longitude limits. These two are shown below, with the later image having a few clouds over Pigeon Valley in conformity with Murphy’s Law, and so I chose that image for annotation, as shown. 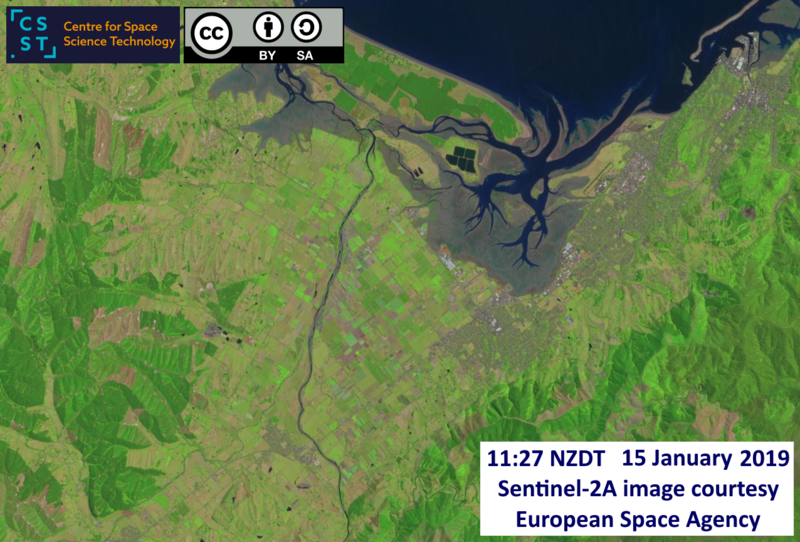 A near-true-colour RGB Sentinel-2A image of part of the Nelson-Tasman region on 15 January. The area covered is about 34.1 km east-west, and 28.6 km north-south. Note the mudflats in Waimea Inlet; this imagery was collected only about an hour before low tide. The same area as covered in the preceding image, but on 4 February. Note the water level in Waimea Inlet; high tide (at Port Nelson) occurred about 45 minutes earlier. Sentinel-2A returns to cover the same area precisely five days later, which means late morning on 9 February. I am writing about eight hours after that; the imagery will be available for download in about another six hours. 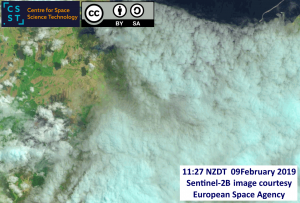 My intent is to update this blog post on Sunday at some stage, once I have obtained the new Sentinel-2A data; however, the day has not been very clear in Nelson, with much cloud this morning, so I can but live in hope. Between the above dates there were passes by the Sentinel-2B satellite, but these all proved unusable due to cloud. All is not lost, though. There are other satellites routinely collecting imagery. The Landsat-8 satellite operated by the U.S. Geological Survey is the latest in a series of Earth-observing satellites that date back to the early-1970s. It delivers imagery with pixel size 30 metres. Landsat-7 is also still operating, but problems with its camera mean that, while useful science can be done with its data, the pictures are not particularly photogenic. We await the launch of Landsat-9 at the end of 2020. Many recent Landsat-8 images proved to be spoiled by cloud – this land is not called Aotearoa for no reason – but we struck luck in that yesterday’s image (8 February NZDT) was clear. Clear, that is, apart from the smoke from the bush fire. 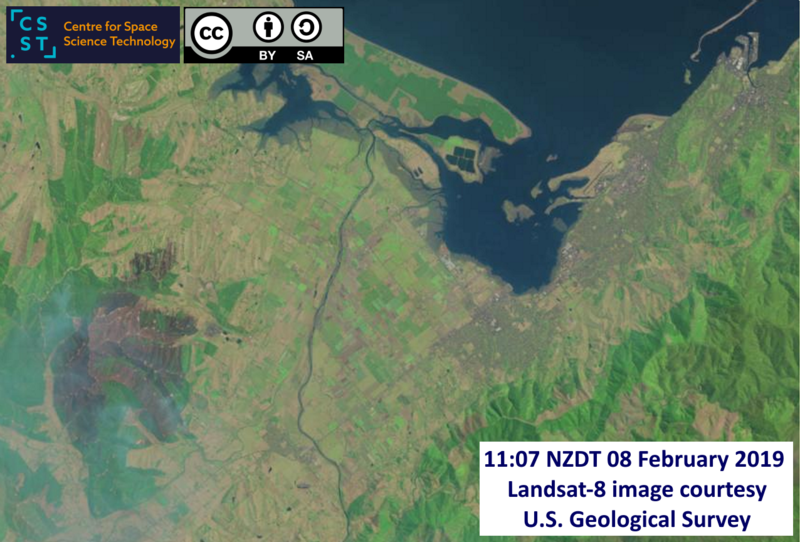 The same part of the Nelson-Tasman region is shown previously, but now an RGB image obtained by Landsat-8 on the morning of 8 February. The burnt area to the north-east of Pigeon Valley is obvious, as is the smoke haze across the region. In the Waimea Inlet the water level is gradually covering the mudflats, with high tide due almost two hours later. Apart from obtaining imagery across the visual and near-infrared spectrum using the Operational Land Imager (OLI), Landsat-8 is also equipped with a Thermal InfraRed Sensor (TIRS). This obtains images by collecting photons emitted by the ground/ocean below (rather than reflected solar photons) in two spectral bands centred on wavelengths of 11 and 12 microns. The spatial resolution (ground-sampling distance, pixel size) is 100 metres. 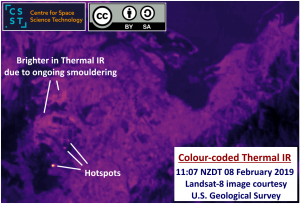 The colour-coded image below shows the thermal emission from the same part of Nelson-Tasman region as in the preceding RGB images. The brighter purple (and maximising in yellow) areas in this image are hotter. Obviously the sea forested areas are colder, as is to be expected. Emission from the burning areas is clear, with a few hotspots being seen but also a wider area where ongoing smouldering is/was taking place. Thermal infrared emission from the bush fire area in Nelson-Tasman. As I wrote above, I would hope to be able to update this blog post within 24 hours with a newer image of the area so that we can see how the burnt tract has expanded. If the Sentinel-2B image obtained today (9 February) is not usable, hopefully either Sentinel-2A or Landsat-8 will give us something to look at within the next few days, else I will try other satellites that may have come over at just the right time to peek between the clouds. Update, 10 February 06:00: As I had anticipated, the Sentinel-2 (actually 2B) image collected on the 9 February overpass is largely obscured by clouds, although a small part of the burnt area north-east of Pigeon Valley is apparent. Addendum 10 February 09:30: The daily satellite images covering the whole of New Zealand that can be seen on the wonderful CawthronEye website are of lower spatial resolution/detail than the above, but are interesting because they show the extent of the smoke being generated by the bush fires. One can check back through previous days (and time of day: afternoon/morning) to see how the smoke cloud has developed. Addendum 10 February 12:50: The lovely people with Copernicus (which operates the Sentinel satellites) in Brussels have tweeted about the Nelson bush fire including satellite imagery; see this link. Thanks for posting this, it is really interesting. Thanks for your kind comment, Gillian. I will do further updates when I can.